I got a call from Brian, who was referred to me from Jean, a woman I had helped out the previous year find her lost ring (Full Story: Lost Ring Found – Madison Garden). She had lost her ring in her backyard while gardening. When she had heard that her friend Brian had lost his ring, she immediately told him to give me a call. The day was January 6, 2014. The temperature was -17 degrees, with a -41 degree wind chill. Let’s just say it was cold. If you remember, we found Lost Ring #2 on another frigid day (Full Story: Lost Ring Found Madison WI – Luck of the Irish). My son and daughter were home from school, due to the historically low wind chills. After I got off the phone with Brian, my wife said – “You’re not actually going to go look for it in this weather, are you”? Well, Brian was in Middleton, which is my home town, so it wasn’t much of a drive. She just shook her head because she knew we couldn’t stand not giving it a try. We brought our metal detector along, but it was simply too cold to do the hunt. Earlier in the week, Brian was over at a neighbor’s house for dinner. Shortly afterwards, he became sick to his stomach and said he had to return home, which was about 4-5 houses away. Unfortunately, Brian did not make it home. He threw up shortly after leaving, stumbled and fell into a snow bank. He said the next thing he remembered is waking up in his own bed, but he had no idea how he got there. After he woke up, he asked where his wedding ring was – it was not on his finger. He figured someone had taken it off while helping him up to his bed. However, no one had removed the ring and no one knew where it was. He thought back to the night before and remembered that he was not wearing gloves when he walked over to his neighbor’s house. His best guess was that it had slipped off when he passed out in the snow bank. The next day, Brian had attempted to shift through the snow himself looking for his ring, but had no luck. As a last resort, Brian like so many others, rented a metal detector with hopes of locating it. However, after hours of frustration he gave up. You see, using a metal detector isn’t overly difficult, but figuring out what all the beeps and tones mean is something that takes practice and a lot of patience. You wouldn’t believe all the metal junk that is buried in the ground. 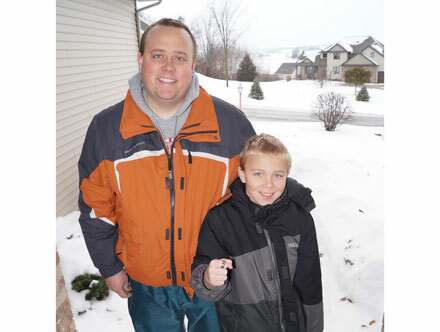 Once the weather had warmed up a little (literally back up to 0 degrees – the winter in WI that year was one of the worst), my son and I returned to Brian’s neighborhood to begin our search. Brian had given us a general area to search. We could see the piles of snow that he had searched through already. After about an hour of searching, we had nothing. It was cold, and we were about to call it quits when I told my son, “5 more minutes”. Well, it only took 2 and we had a strong signal. A couple scoops of snow and right there staring back at us was Brian’s shiny tungsten carbide wedding ring. Carter and I got a quick picture with our find, and then handed it back to Brian. He still couldn’t believe that we found it, because he had search and searched on his own. He figured someone had picked it up and he would never see it again. Brian gave us a nice reward, which went toward two nice hot glasses of hot chocolate! If you are reading this and lost your ring today, last weekend or 10+ years ago, please give us a call at (608) 492-1070. Write down as many facts about how and where you lost your ring. 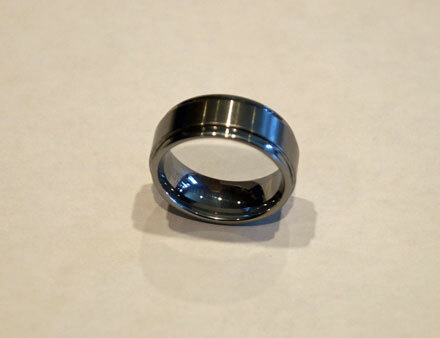 These are so important and can be the deciding factor in whether your lost ring is found or will remain lost forever. We never gave up hope and amazingly we were able to return Brian’s lost ring back to his finger. Please “Like” our Facebook page and you will get every Lost Ring Story delivered to you. Also, please share this story on your Facebook page, so together we can reach more people to help find their lost rings. Remember, every ring has a story, what’s yours?